Your output rectangle should be returned using this format. Given two rectangles, write a function that can find the rectangular intersection between the two rectangles. The rectangles are always straight and never diagonal (each side is parallel with either the x axis or the y axis). Consider only positive axis. This seems like a problem where you have to perform many calculations around both rectangles to try and find the intersection points. Surprisingly there is an easier and simpler way, but it was not very easy to spot for me. If you put the x axis points from both rectangles into a list and sort them, and then do the same for the y axis points for both rectangles, you can find the points of the intersection rectangle pretty easily. The points of the intersection rectangle will be the two middle points of each list, if the rectangles overlap. With this information we can easily calculate the intersection rectangle’s width and height with some simple subtraction and return an answer. ⚠️ This method will only work if the triangles overlap. 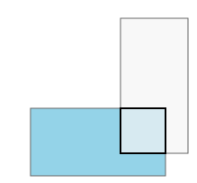 So before we try to find an intersection rectangle, we must first determine if the rectangles overlap or not. We will do this by substracting the right-hand side to the farthest left minus the largest left-hand side to the farthest right.